"Language is more than just a collection of words. Language is movement, gesture, emotion and, above all, meaning and context. 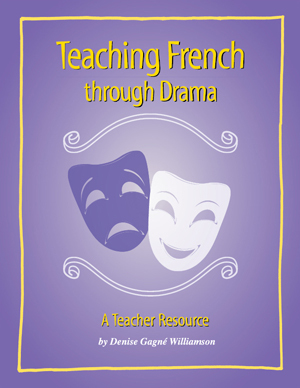 Using Drama in your French class allows the language to come alive!" Teaching French Through Drama Add interest and variety to your FSL or Immersion Program! Here's what real teachers have to say about the strategies Denise presented for integrating Drama during convention sessions in 2011. Wonderful fresh ideas! One of the best sessions I have been to in terms of creativity. Merci! I found this session well worth it. Denise has given me many wonderful ideas which I could easily implement in my classroom. Denise gave me some great ideas to start right away. Excellent! Excellent strategies for motivating students. Sound pedagogy for second language teaching. Very enthusiastic presentation. It really got me thinking. Your session was awesome! I am a Japanese teacher, but I can easily see how to transfer these ideas into my classroom. Thank you very much! Denise earned a BA in Theater and Music from Université du Québec à Montréal in 1985 and a graduate diploma in Early Childhood Education from the University of Calgary in 1992. For the last 25 years she's been exploring and perfecting the use of Music and Drama as uniquely effective tools in the elementary French classroom. Denise has firsthand experience; from Kindergarten to Grade Six, of how much easier it is for students to learn a second language when vocabulary is brought to life in song, rhyme, movement, or as a dramatic experience.